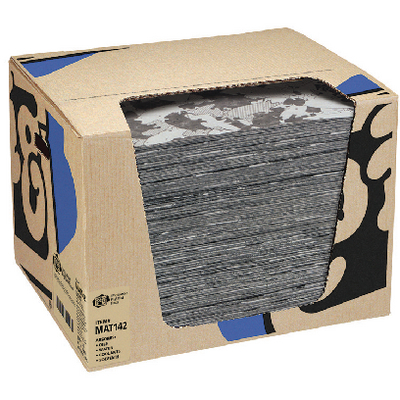 Heavyweight construction delivers greater durability and absorbency for demanding tasks and large-volume cleanups. Fast-wicking "diaper action" transfers liquids from the top layer into the absorbent inner layers; spills disappear in seconds. Tough, spunbond top layer stands up to heavy foot traffic; won't rip, tear, fray or create a trip hazard, even when saturated. Under the Ham-O top layer is the proven eight-layer, 100% polypropylene construction of PIG Mat. Exclusive dimple pattern speeds wicking of liquid throughout mat for faster, easier cleanup. Absorbs and retains oils, coolants, solvents and water. Flame-resistant material won't burn immediately like cellulose mats; melts when exposed to high heat while on the job. Can be wrung out and incinerated after use to reduce waste or for fuels blending. Dispenser box makes it easy to take, carry and store your mat while protecting it from dirt and moisture. Rolls are Excellent for walkways and and large areas to soak up leaks and overspray. Easy-tear perforations let you take only what you need, so you use less mat and save money.